Contagion is out exactly one month today: 18-05-17! To celebrate? A giveaway! There are two copies of Contagion to be won. All you have to do is put a comment on this blog, below. Tell me why you'd like to win! Two winners will be chosen at random. Open until noon UK time next Tuesday , 25th April! Don't forget to check back here next week to see if you've won! 4. finally on Instagram! @teriterrywrites: 9 - 16 May! Heya, I found one of your books in my school library. I gave ita read, and I really enjoyed it! A few months ago you came to my school (I got my slated book signed). Then I started reading slated, I loved it! Then I read fractured- which I also was amazed by. And finally I am coming right to the end of Shattered, and now I can't wait to read contagion, even though it's a different series I am still hyped! I am sooo exited and can't wait to order! Thanks for giving me a great trilogy to read, and I'll be looking forward to your next book! Contagion isn't out yet: it's out in the UK on 18th May. Cannot find it for sale in usual places. Where can I get it! whoops I can't spell: that is Pippa Coyle. Sorry, Pippa! And the winners are ... comment no. 27 - Pippa Cole, and comment no. 6 - Jenni Foale! Congratulations! I'll put up a new blog post in just a few minutes which will tell you how to claim your prize. Last Year, when I was visiting my Mum, I bought the Slated Book at a Bookstore. I fell in Love with it and Your writing Style and proceeded to buy every other Book I could find. Ever since I heard that you were releasing a new book, I've been beside myself with excitment! I've loved every single one of your books and I can't wait to read Contagion! Last Year I met you at the Frankfurt Bookfair and since than I am waiting for a new Book to come. Slated is one of my favorites. In 2013 my friend got me Slated for my birthday and I thought the book was fantastic. I had to wait months to read the second book and more than a year for the third book to be released here in Brazil. and it was worth waiting! I loved that trilogy and I promised myself I'd read everything you wrote and for me it would be a honour to read your new book in the original language, not the brazilian portuguese version. Love from Brazil. Hi, I would really like to win the book CONTAGION because I've loved reading your slated triology and I am interested to read an exiting story of you again! I remember when I went to that bookstore with a friend and I asked her:"Which one shall I buy?" holding up two books. She pointed to the one in my left hand. I started reading it on the way home and just after finishing it I read it a second time. This book was 'Slated'. After having read all the other books by Teri (I have pre-ordered all of them because I couldn't wait) I can now tell you proudly: "I am in love with Teri Terry's writing!" If she wrote a book about how to use a hammer I'd buy it. I am looking forward for 'contagion' and I am truly excited. I'm waiting like a hungry wolf for the new book. Hi! You visited my school a couple weeks ago and I was so excited to meet you! When you read a section from your new book contagion I couldn't wait to purchase it. I loved the slated series and it has managed to sneek up to the list of my favourite books. I love writing myself and reading your books have inspired me to write more! I have ordered mind games and I can't wait to read it. Please keep writing, I enjoy your books so much! I just found out about the give away and was absolutly thrilled. My mon and I have loved reading your books, since I by chance got my hands on 'slated' we have always been forward to what you will write next. Other than that, I am a student and my exams are soon coming up, so it would be absoloutly amazing to have something else and more 'fun' to read in the evenings, while relaxing after studying math for a whole day. This is a gratis opportunity. I'm waiting for this book since you told us about it on the Frankfurt Bookfair last year. I love all your books and this is a big chance to be one of the first to read it. So maybe I'm one of the lucky ones. This would be really awesome!!! Love you and your work, wish you the best! I'm a school librarian and I bought the Slated trilogy for my students, but I was the first one to read it, and love it ! I'm now a fan of your books and buy everyone of them, for the school, and for me ! Why I'd like to win? The only reason, because I'm not sure Contagion will publish in Indonesian edition (I'm glad Slated Trilogy came with Indonesian edition too and knew about you), that makes me wait for two or three months until your new book (english edition) come out in my local book store. And I think I can't wait too long. And I still can't move on from Slated Trilogy and Book of Lies, those books change the way I feel about something thrilling not only about gun and war, also about our demon. Surely Slated change my writing too. God, please I want Contagion. I am challenging my luck to be one of the 2 persons to be drawn. Why? I am just looking forward to another thrilling book as slated. The book of lies was a bit too let's say mystic in my opinion. Therefore I am still on research. Big fan of your books and would love to get my hands on a copy! I´d love to win Contagion because I´m obsessed with all of your books and I can´t wait to hold another one in my hands. I´m really excited about the storyline and about how Callie will be like, so I´d be very thankful to be one of the first reading your new book. I rly wanna win as I love all yr books so much and my mum is yr friend debs so it would not be hard to get a copy although I don't have money to buy it myself!! I would love to win this book as I have read all of Teri's book, enjoyed and loved them to pieces! I loved selling them to people in Waterstones. She is one of my favorite authors, I love recommending her books to people and I hope one day to be a slither as good an author as her. So excited to see what she does next! Thank you for this giveaway! Would love to win because I'm a huge fan. There are no words or reasons to explain why I want to read the best and the most amazing book ever! I'd love to win a copy of Contagion because I really like your books and your way of writing. Also, I read Mind Games about two weeks ago and it was absolutely AMAZING, so it would be great to read more from you! Also, good luck to anyone who enters! I'm sure, that i will love Contagion, too. I'd love to win Contagion because I don't know if I can wait another month!! I demolished the Slated trilogy within a weekend and Mind Game blew my mind. I can't tell you how many people I've recommended Book of Lies to. I love your work so much and I can't wait to read Contagion as soon as I can! I would really like to win this book because I really loved your writing style. I read Slated (which was how I got to know your work) and I loved it so so much, I think you have so much talent and I would love to read more from you. Please continue writing and doing what you love most! Hello! I would loveee to win Contagion because it would be so special to me! I have read all your books and loved the all! I feel that you write your characters so so well and for me ,when I read your novels, that is what I am most excited for. I can't wait to read Contagion and then write about on my Instagram page! I am sure it will be great when I read it. I loved reading the Slated Trilogy. That's how I got to know your work. It would be a great pleasure to win this book. Please continue writing. Your stories have to be read! I would absolutely love to win Contagion!! I read the slated triology several times, my favourite series, and Mind games as well as The book of lies was sooo gripping. I love your writing style very much and am looking forward to your new book!!! I'd like to win your new book for my daughter. She's a huge fan and to be honest - I really enjoyed reading your books too! I would love to win this because I am a massive fan of all of your books and I have been waiting since it was announced for it to come out. Teri Terry books are my favourite because the characters have great personalities and the stories are so creative. I absolutely adore your work and winning would make me so happy. I would love to win I love your other books and don't this one sounds amazing! Definitely on my list of to read! I love it when authors release new books after ive read some of their old ones! Slated was absolutely amazing and i havent read in a while and Contagion would be a great book to get me reading again! I'd love to win a copy of contagion because I've read all your books and have all of them signed! I'm really excited to read a new book from you, and will probably devour it in one sitting! It makes it so much more special if I'm reading a book I won! As your #1 fan I would really be happy if I won Contagion! I can't wait to read more of your work! I loooved your Slated trilogy and can't wait for Contagion! Oh, this would make not my day, my whole month! I loved the Slated series so much that I read all 3 in barely a week, and I'm finding time to read something else by Teri. But I'm trying to turn my little sister into a keen reader like me, and I'm sure this will help me in this life-changing task!! I would love to win because I am a huge book worm. I love the Slated series, and would love to read more. Also, May is the month of my birthday and a book would be the perfect gift! I'd love to win because I have read and loved all your books. I am obsessed with the concept of this book and it ilia my most anticipated read of the year. On a more serious note, I LOVED your trilogy Slated. I grew extremely attached to the characters and enjoyed every second I was reading in. Your style of writing and the plot blew my mind away, there was so much mystery I couldn't put the book down! I would be thrilled to read another of your books and Contagion looks amazing! I would love to win because I love to read! Reading has always been my go to when I'm stressed, bored, angry. I would love to add Contagion to my books! I've read all your other books, so would love the chance to get my hands on this!! Hi! I would love to win a copy of your new book so I have a chance to read it before my daughters (aged 13 and 9) swoop on in and read it before me! (just as they have done with your other books!!). Then I am the one with the sneaky "I know what's coming next " smile!! I'd love to win, because reading is my escape and my solace from my hectic life! I've adored all of your previous works and I'm sure this won't be an exception. Anyway, you've been teasing us for too long about Contagion! Even if I don't win, May is looming ever closer to be able to get my hands on it! I'd like to win a copy, because I totally fell in love with your books. I bought my first Teri Terry book at the book fair in Frankfurt last year and read all your books within a few weeks! I can't wait to read the new one! 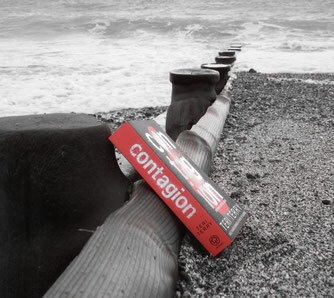 I'd love to win a copy of Contagion because you have got me intrigued about what it is about. I have loved every single one of your books because of the mystery and twists that are always on every page. I'm never bored when reading one of your books. Your characters are always ones with brilliant personalities. Regardless whether I win or not I can't wait to get my hands on a copy of Contagion and get lost in the world and the story.